It’s all about season finales and the ramp-up to the royal wedding tonight. 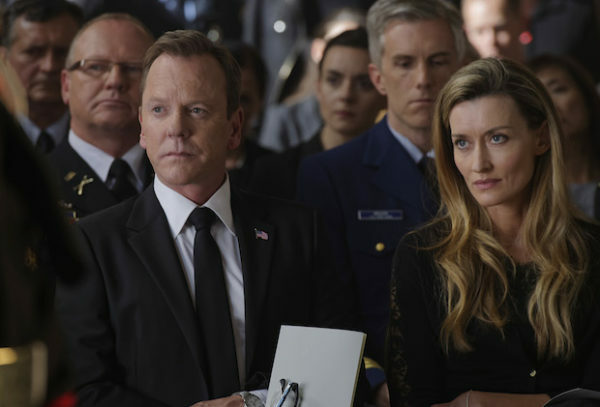 For its last episode, “Designated Survivor” (ABC, 10 p.m.) could have devised a neat ending to its series, answering all questions after two seasons. But the network pulled the plug on the series starring Keifer Sutherland too late to do so. As it is, it sounds like they’re probably ready to unveil a cliffhanger. Also airing its last episode ever tonight is the Zach Braff comedy “Alex, Inc.” (ABC, 8:30 p.m.). The remaining half dozen shows end their seasons, but have been renewed for another season, from “The Goldbergs” (ABC, 8 p.m.) to “Riverdale” (The CW, 8 p.m.), “The Blacklist” (NBC, 8 p.m.), “Modern Family” (ABC, 9 p.m.) “SEAL Team” (CBS, 9 p.m.) and “American Housewife” (ABC, 9:30 p.m.). The special “Inside the Royal Wedding: Harry and Meghan” (NBC, 10 p.m.), hosted by Savannah Guthrie and Hoda Kotb, plays opposite the week-long “Royal Wedding Watch” (PBS, 10 p.m.) with Meredith Vieira and Matt Baker. There is also “The Royal Wedding” (BBC America, 8 p.m.) looking at the 1981 wedding of Prince Charles and Diana Spencer, whose death is explored in the subsequent “Diana, 7 Days” (BBC America, 9 p.m.). On the new “SciJinks” (Science, 10:05 p.m.), Johnny Galecki lives up to his “Big Bang Theory” character by hosting a show featuring scientists presenting big stunts. On the third episode of “Being Serena” (HBO, 10 p.m.), Serena Williams returns to the tennis court for the first time in almost a year after giving birth. On “Empire” (Fox, 8 p.m.), Cookie and Lucious try to keep their company in the family. The latest episode of “The Handmaid’s Tale” (Hulu, streaming) has Janine trying to adjust to life in the colonies. “Survivor” (CBS, 8 p.m.) has a tough immunity challenge. The arms control summit is under way on “The Americans” (FX, 10 p.m.). One of the darkest episodes of “Brockmire” (IFC, 10 p.m.) has him going home for the funeral of his father. “America Inside Out with Katie Couric” (National Geographic, 10 p.m.) wades into the world of political correctness. A woman is reunited with her birth mother on “This is Life Live” (TLC, 9 p.m.). Alex ditches Noah on “Star” (Fox, 9 p.m.). On “Krypton” (Syfy, 10 p.m.), Seg has to decide whether to make the ultimate sacrifice for the greater god of Kandor. “Law & Order: Special Victims Unit” (NBC, 9 p.m.) will move to Thursdays in the fall. Klaus gets closer to finding Hayley on “The Originals” (The CW, 9 p.m.). “NOVA Wonders” (PBS, 9 p.m., check local listings) examines the search for extraterrestrial life. Bethenny and Dorinda go to Puerto Rico to work on what I hope is hurricane recovery on “The Real Housewives of New York City” (Bravo, 9 p.m.). Beverley accidentally eats a pot brownie on “Hollywood Darlings” (Pop, 8 p.m.). “The Expanse” (Syfy, 9 p.m.) has the final battle between Earth and Mars. Elliot is sued for the death of a SWAT officer on “Code Black” (CBS, 10 p.m.). On “Colony” (USA, 10 p.m.), Will assesses the safety of the Resistance camp. It’s Erykah Badu vs. Snoop Dogg on the first of two “Hip Hop Squares” (VH1, 10 p.m.). The Andy Hardy movies are still going on all day on Turner Classic Movies, with “Judge Hardy and Son” (6:30 a.m.), “Andy Hardy Meets Debutante” (8 a.m.), “Andy Hardy’s Private Secretary” (9:30 a.m.), “Life Begins for Andy Hardy” (11:15 a.m.), “The Courtship of Andy Hardy” (1 p.m.), “Andy Hardy’s Double Life” (2:45 p.m.), “Andy Hardy’s Blonde Trouble” (4:30 p.m.) and “Andy Hardy Comes Home” (6:30 p.m.). Tonight, there are four movies about the “Five Little Peppers and How They Grew” (8 p.m.), “Five Little Peppers at Home” (9:15 p.m.), “Out West with the Peppers” (10:30 p.m.) and “Five Little Peppers in Trouble” (11:45 p.m.), followed by the start of a Dr. Kildare marathon with “Young Dr. Kildare” (1 a.m.), “Calling Dr. Kildare” (2:30 a.m.) and “The Secret of Dr. Kildare” (4:15 a.m.). Stanley Cup playoffs reach game three in the Western conference finals with Winnipeg at Vegas (NBC Sports, 9 p.m.). In the NBA Playoffs, it’s Golden State at Houston (TNT, 9 p.m.) in game two of its Western conference finals. Baseball includes St. Louis at Minnesota (MLB, 1 p.m.), Milwaukee at Arizona (MLB, 4 p.m.), Yankees at Washington (ESPN, 7 p.m.) and Houston at Angels (MLB, 10 p.m.). Soccer has the final in the UEFA Europa League, Marseille vs. Atletico Madrid (Fox Sports 1, 2:30 p.m.). Bicycling’s Tour of California (NBC Sports, 4:30 p.m.) reaches stage four. Kelly Ripa and Ryan Seacrest: Candice Bergen, Nikki & Brie Bella, A Great Big World. The View: Donald Rumsfeld. The Talk: Andy Garcia, Carrie Ann Inaba. Harry Connick: Sal Vulcano & James Murray, Carl Lentz. Ellen DeGeneres: Portia de Rosi, James Bay. Wendy Williams: Dave Mizejewski. The Real: Salt-N-Pepa, Kate Walsh. Stephen Colbert: Chadwick Boseman. Jimmy Kimmel: Diane Keaton, Jim Acosta, Beach House. Jimmy Fallon: Will Ferrell & Molly Shannon, Chrissy Metz, Florence + The Machine. Seth Meyers: Josh Brolin, Ella Purnell, the Aces, Mat Byrne. James Corden: Diane Keaton, Andy Garcia, James Acaster. Carson Daly: Natalie Dormer, Two Feet, Allison Raskin. Trevor Noah: Terry Crews. Jordan Klepper: Lizz Winstead. Conan O’Brien: Joel McHale, Anna Paquin, Alex Edelman (rerun).